Megan Fischer, Tracey Maloney and Nöel Raymond. Photography by Petronella Ytsma. Park Square Theatre, in association with Carlyle Brown & Company, has premiered a new play by Carlyle Brown, taking Park Square down an adventurous path. A commissioned piece by the theater, American Family explores the idea of a mixed-race marriage in 1960’s Alabama. Laura Collins (Noël Raymond) is determined to overcome the societal taboo of marrying an African-American man, Jimmy Richardson (Gavin Lawrence), but even with their love for each other and the strong support of his mother, played by Greta Oglesby, and dad, played by Brown, it’s a conflict too big to win, and Laura’s young daughter, Mary Ellen (Megan Fischer) is taken away by her estranged father, Billy Collins (John Middleton). Director Marion McClinton was blessed with a cast composed of Twin Cities luminaries, all delivering clearly defined characters with their own story to tell. But it was Fischer (12 or 13 years old?) who made every scene her own and lifted us gently into her private and innocent world. I actually hope she doesn’t get any more training. She doesn’t need it. She just simply “has it.” She was also gifted by the playwright with the most “in-the-moment” characterization, which helped us connect to her emotionally in a way that we could not with the other characters. The premise—that a white woman could be deemed an unfit mother because she married an African-American man—has plenty of impact to power dramatic action, but Brown chose to let the events of their lives be remembered. In other words, instead of showing us the turning point moments (for example, Mary Ellen finally opens her mother’s letters; Jimmy backs away from a potentially violent confrontation) we learn of these through the filter of the characters’ memories about them. This also gives the characters opportunities to explain themselves and add to the emotional threads that early in the play seem so beautifully intertwined and later become a tangle of hurt. In fact, even those moments that could have been dramatic felt like memory, such as when Laura meets her new in-laws, and when Mary Ellen finally meets her brother. This tone was so consistent that it became almost Brechtian in its detachment from the moment. Yes, there was emotional content, but seen through a veil as if it was strained through time. This was more effective in Act I. Act II was too heavily laden with exposition that we either didn’t need, or it should have been in Act I. The difficulty with a play powered by a forbidden relationship is that the attraction between the two characters has to be stronger than the forces that keep them apart. The action of the play says that it is, but the chemistry happening between Raymond and Lawrence says that it wasn’t. I applaud Park Square for their commitment to new work, particularly for their support of artists with roots in the Twin Cities, and I hope that this piece is just the beginning of the adventure. 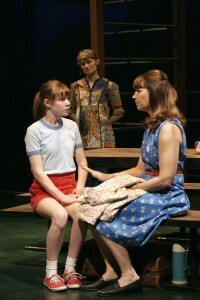 American Family runs through April 7. Brovo to all and thank you Park Square for a great eye opening experience.